No, your eyes are not playing tricks on you; this photo was taken with the camera’s “fish-eye” setting. It is from the Crazy Gringos’ performance at Galion’s Independence Day celebration last year. They were joined by Chicago musician Will Tilson, right. When the Galion band Crazy Gringos hit the stage in Delaware this weekend, it will be homecoming and family reunion for Delaware native and guitarist Steve Tilson. The Gringos are playing at the sixth annual “Blues Barbeque Benefit,” a blues festival to raise money for Andrews House, a non-profit community service center that is home to six social service agencies. 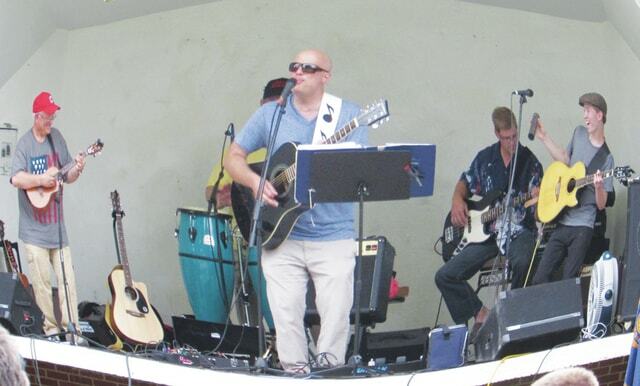 Galion attorney Tilson plays guitar in the band, and the event will be special. Tilson’s son, Eric, is the singer and lead guitarist for the band. Tilson’s nephew, 15-year-old Will Tilson, will also perform that night as a solo act. He described both of them as extremely talented musicians. “It’s a neat thing to cultivate musicianship. Sometimes I’m so into watching them that I forget to play my own part,” he said. Will, who hails from the northern suburbs of Chicago, has been playing guitar since he was 9 under the tutelage of jazz guitarist Cary DeNigris. He recalled that it was Steve who first introduced him to the blues, and he then became interested in Chicago’s thriving blues scene. Of his solo performances, Will explained: “I play blues and soul. I’d say somewhere between Otis Redding and Muddy Waters. I take older, obscure songs and give them new twists” — obscure songs from the blues label Chess Records, like Otis Spann’s “Ain’t Nobody’s Business.” He has a few original songs as well. To see videos of his performances, visit willtilsonmusic.com. He will perform a couple of numbers with the Gringos on Saturday, which he said he has not done since Fourth of July weekend last year in Galion. While they aren’t sure what songs they will do together, Will hinted that B.B. King is a likely candidate. The Crazy Gringos have been together for 12 years now. In addition to Erlsten on bass, they have Delaware’s Roger Mayes on drums. Mayes actually replaced Erlsten’s father, Steve, who retired from the band last fall. Erlsten will not be performing with the Gringos on Saturday, but said he’s ready to come back when the band performs at June 9’s Music in the Park in Galion. With their new drummer, he said they will perform Led Zeppelin’s “Rock and Roll” (a song known for its drum section) for the first time in years. He organizes the Gringos’ set list — not an easy task when you have 150 songs in your catalog. And Erlsten said they are always looking for new ones to add. They play favorites — old and new — from various musical genres. The Gringos will also play on July 5 during the Pickle Run in Galion and will return to Delaware for a show on June 13. The Blues Barbeque Benefit is Saturday at the Merchant Building of the Delaware County Fairgrounds, 236 Pennsylvania Ave. Food will be served from 6 to 7 p.m., with live music from 6:45 to 11 p.m. Tickets cost $40 (dinner and music); or $20 to $25 (music only) at www.andrewshouse.org or 740-369-4520; or at the door. For more information, call 740-369-4520 or visit www.andrewshouse.org.